St. Paul's is a place where ALL are welcome! Through Integrity's evangelism, thousands of LGBT people, estranged from the Episcopal Church and other denominations, have returned to parish life. Contact Lori for more info 699-5880. Lori, Bishop Gene Robinson, and Aaron. 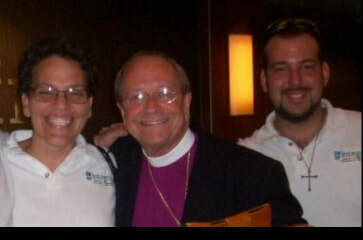 Bishop Robinson was the first openly gay Bishop in the Episcopal Church. On gay rights, tolerant Christians need to come out of the closet. St. Paul's Episcopal Church affirms that it is a Welcoming Congregation, one in which gay, lesbian, bi-sexual, or transgender persons, either singly or with their partners, are welcomed and treated the same as all other persons or couples in the parish. Additionally, being welcoming means that all LGBT persons will be considered for leadership positions, including serious and honest consideration for Holy Orders, without regard to sexual orientation or gender identity. Furthermore, St. Paul's Episcopal Church affirms that the rites "Celebration and Blessing of a Marriage" and "The Blessing of a Civil Marriage" are available for all LGBT couples. The Blessing of the Union of Lori and Arcelia Toia, December 8th, 2012. First same-gender blessing of the Diocese of San Joaquin. Lori came to the Episcopal Church searching for a home church that would teach that all of God's children are equal in his eyes. She sought a church that would allow her daughter to be baptized and accepted without being made to feel ashamed of her lesbian mom. Her daughter is now 11 and serves as an acolyte at the altar along with Lori who is a Lay Eucharistic Minister. 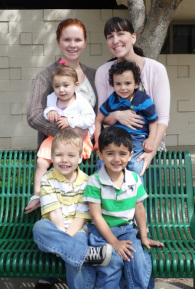 The Toias are an excellent example of an LGTB couple who have devoted their lives to serving Christ and His people.